Since 2009, the Applied Technology Council has been carrying out a series of FEMA-funded projects (ATC-78 project series) focusing on the identification and mitigation of nonductile concrete buildings. Investigations undertaken on these projects are being coordinated with other related activities within the National Earthquake Hazards Reduction Program (NEHRP). The activities have taken on special importance given the decision by the Mayor of Los Angeles in 2014 to seek the adoption of a municipal ordinance to reduce the seismic collapse potential of older nonductile concrete buildings. An issue of significant concern to earthquake hazard mitigation specialists in the United States is the expected poor seismic performance of older, seismically vulnerable concrete buildings, known as nonductile concrete buildings. These buildings were constructed prior to 1980, and include archaic construction dating back to the early 1900s. Not all such buildings are hazardous, but those that are contain inadequate steel reinforcing details, system irregularities, and element discontinuities that could result in sudden shear failure and loss of load-carrying ability. While design and retrofitting criteria have been in place for mitigating hazardous concrete buildings for many years, the problem remains one of identifying which buildings within a large inventory of buildings are in fact hazardous. Because of the hidden nature of the problem, it is often difficult to visually determine which of these buildings would be collapse hazards and which would not. In recognition of the need to develop a low-cost, easily implementable methodology to identify collapse-hazard concrete buildings, the Federal Emergency Management Agency (FEMA) has awarded the Applied Technology Council (ATC) several task order projects under Task Order Contract HSFEHQ-08-D-0726 and Contract HSFE60-12-D-0242 to develop a new evaluation methodology that will more easily and accurately predict the seismic collapse potential of older non-ductile frame and wall buildings. Efforts undertaken to date have been performed under four task orders, all with the same objective, title, and personnel. The FEMA-funded efforts on mitigating the seismic hazards of older nonductile concrete buildings are coordinated with and build on other efforts to address this hazardous type of existing construction being undertaken by other agencies involved in the National Earthquake Hazards Reduction Program (NEHRP). These include (1) earlier efforts by the Building Seismic Safety Council (BSSC) of the National Institute of Building Sciences (NIBS), with funding from the National Institute of Standards and Technology (NIST)to identify subclasses of nonductile concrete buildings, based on their collapse hazard potential(see NIST, 2010a); (2) the National Science Foundation funded Network for Earthquake Engineering Simulation (NEES) Grand Challenge Project, “Mitigation of Collapse Risks in Older Reinforced Concrete Buildings;” and (3) the NIST-funded effort to develop the GCR 10-917-7 Report, Program Plan for the Development of Collapse Assessment and Mitigation Strategies for Existing Reinforced Concrete Buildings (NEHRP Consultants Joint Venture, 2010). 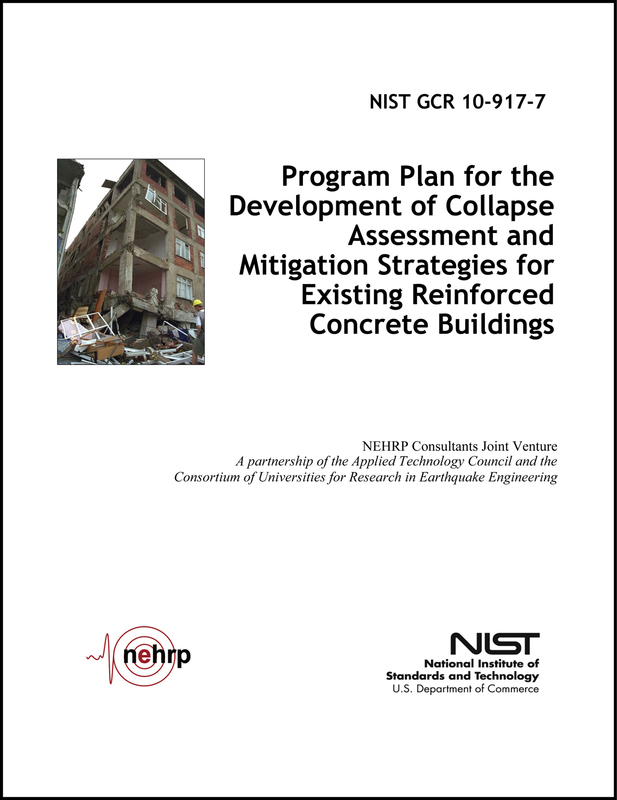 A key piece of the NIST Program Plan, which recommends a comprehensive program that is projected to take up to 10 years to complete, was the development of what is termed “collapse indicators”—those characteristics of many older concrete buildings that make them a high risk to collapse in strong earthquake ground shaking. Initial efforts under the FEMA-funded ATC-78 project series were conducted over a 24-month period, beginning in 2009. Those efforts, designated as the ATC-78 Project, included the refinement and testing of analytical procedures for identifying and prioritizing collapse indicators, as proposed in the NIST Program Plan, within selected subclasses of nonductile concrete buildings. The principal product of that effort was the ATC-78 Report, Identification and Mitigation of Seismically Hazardous Older Concrete Buildings: Interim Methodology Evaluation, which was completed in December 2011. That document describes the overall efforts on the project through December 2011, including initial testing of the proposed collapse indicator methodology to assess the probability of collapse of older concrete buildings and the documentation of results from initial analysis efforts. The second project in this series (ATC-78-1 Project) commenced in 2011 and ended in December 2012, with the publication of the ATC-78-1 Report, which supersedes the earlier ATC-78 report (which is now considered an internal interim report). 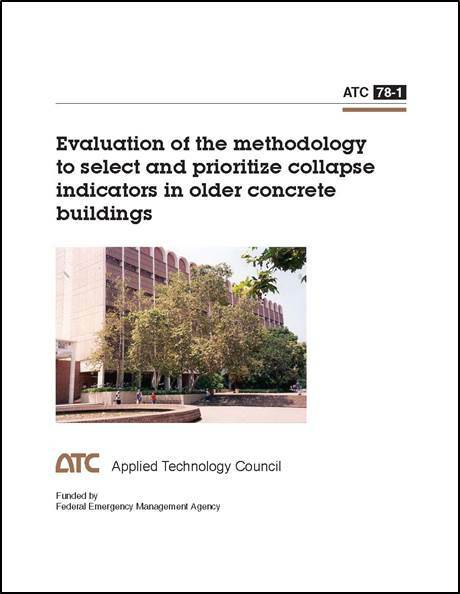 The ATC-78-1 Report, Evaluation of the Methodology to Select and Prioritize Collapse Indicators in Older Concrete Buildings, contains much of the same background information as the earlier document, but expands considerably on the evaluation of the proposed assessment methodology and provides a summary of the trial analysis studies, descriptions of important technical issues and their resolution, and updated conclusions and recommendations. Many collapse indicators were studied, some from lists in the NIST Program Plan, and some identified in this project, and many insights into the behavior of this building type were obtained. In 2012, however, several issues were identified regarding the development of an efficient evaluation technique using collapse indicator relationships. Although an interesting study was completed combining the two primary collapse indicators for columns, Vp/Vn (ratio of column plastic shear demand (controlled by flexure) to column nominal shear capacity) and Mc/Mb (ratio of column end moment to beam end moment), it was impractical to create all combinations of collapse indicators and perform incremental dynamic analysis (IDA) for each one. Other issues that were identified with the collapse indicator method included the need to complete the extensive analysis regime for structures of different heights, and the difficulty of modifying the values of some collapse indicators without significantly altering others or the base shear strength of the structure. For example, to test a weak first story, the strength of the first story was changed relative to the upper stories, but the absolute value of that strength also has a significant effect on the collapse potential. Although providing insight into important aspects of predicting global collapse, the collapse indicator method was finally judged to be unsuitable as a basis for the low-cost, easily implementable methodology sought by FEMA. C. Change of Project Focus in 2013. In early 2013, the focus of the ATC-78 project series was altered to develop a new evaluation procedure/methodology that uses story drift as the primary engineering demand parameter. Part of the rational for this decision is the fact that the greatest amount of data available on the capacity of concrete components are based on drift and deformation. The new evaluation procedure/methodology was to be based on two major concepts: (1) development of an efficient way to estimate roof drift and story drifts based on the spectral demand for a building and the response characteristics of the structure, and (2) development of a systematic method to estimate the relative risk of the collapse of columns with different characteristics based on drift demands. Efforts on the ATC-78-2 Project, which effectively commenced in early 2013, focused primarily on the development of an evaluation methodology specifically for concrete frame buildings. At the same time, preliminary efforts were also devoted to the concepts that would be incorporated in the comparable evaluation methodology for concrete buildings with structural walls. Work on the ATC-78-3 Project, which effectively commenced in early 2014, focused on finalization of the draft frame evaluation methodology for concrete frame buildings and continuation of the development of a concrete wall evaluation methodology. This work resulted in the publication of the ATC-78-3 report, Seismic Evaluation of Older Concrete Frame Buildings for Collapse Potential. Work on the ATC-78-4 Project, which effectively commenced in early 2015, is focusing on expansion of the evaluation methodology to concrete wall systems. Work will also include a formal trial evaluation program to test the clarity, usability, level of effort, and need for calibration of the methodology for concrete frames. What are non-ductile concrete buildings and why are they a risk to the public? What can a community do to address the risk presented by non-ductile concrete buildings? Is it possible to develop a local ordinance to address this risk, and what would it look like? What is the FEMA/ATC Older Concrete Buildings Project? What is the current status of the FEMA/ATC Older Concrete Buildings Project? Can the ATC-78/FEMA draft document be used this year to perform an analysis?